Butterflies, Classes and a 25th Birthday Celebration! Coordinating dies - Delia Butterfly 98353 and the intricate Finn Butterfly - make a quick summer card for any occasion. I love how the soft translucence of vellum creates a shadowy effect on the Bill of Sale background here. The delicate Finn Butterfly overlay really pops against the Kiwi vellum - add a few of the cutouts to create a design-within-a-design. July 21st is also a special day for Impress - it's their 25th Birthday celebration! Join the celebration at all three stores and enjoy a 25% discount on purchases that day. It's their way of thanking you for your support, friendship and creativity throughout the years! It takes just a few minutes to grow a magical garden of colorful blossoms and flitting butterflies with the Summer Border Die 98338. That's even faster than those garden-in-a-can kits! The Metal Adapter Plate helps create this intricate diecut twice - from Dill Cardstock and the bright plaid from the Brioche 6x6 Set. A quick greeting with the Thank You Combo B1751 (there's a tiny butterfly attached to the side of the stamp) becomes a little garden sign. The Small Pinwheel Posie 98271 is a swirly sun when it's cut from Squash Dots and simply attached to the card (instead of twirled into a dimensional flower). Summer's finally arrived, even in Seattle...enjoy your garden and let it inspire you to create a set of sunny greetings in bright, splashy colors. The Memory Box Dies Collection has all of the trees, leaves, flowers, borders, birds, butterflies, garden gates and fences you'll need! Create a colorful card to celebrate a summer birthday with the Grove Branch 98311, Grove Leaves 98348 and Floral Delights 98349. The sweet little Floral Delights flowers don't just look pretty - they multi-task and help attach the delicate branches to the background too! View the Memory Box Dies from the Summer Collection - and classic favorites - here. Let your favorite Memory Box Dies do the work for you - like I did on this simple card. Just diecut the Selena and Maribelle Butterflies, saving some of the little pieces to attach to the background. The classic Journey Collage G1733 creates a quick background. Add a trio of mini-brads glittered with Silver Lining Glitter from Clearsnap for some sparkle...and your card is ready for a grad, new hire or world traveller. 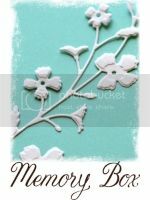 And here's another design created around our dies - Whimsy Circle and Delicate Vine - on the Design Team's Outside the Box blog.